We no longer list tulips for pots and borders in this catalogue. Please see our main AUTUMN CATLOGUE for these. This late flowering species is the only tulip we grow here. 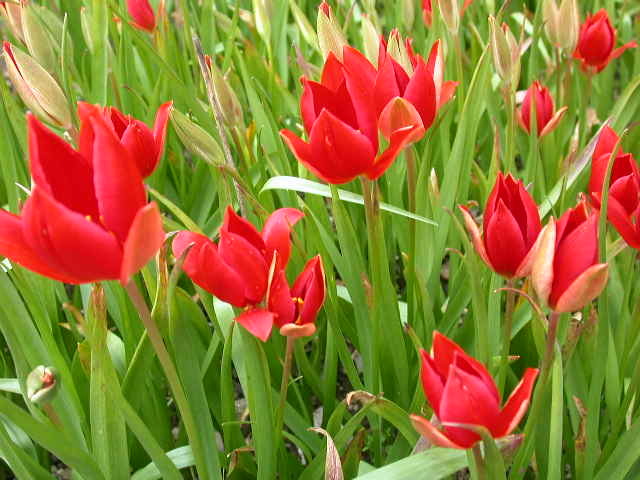 (species tulip)This small scarlet tulip is the very last to flower. It does not increase by offsets like most tulips but has to be grown from seed - it will self seed on a dry, sunny rock garden or in thin grass or even among hostas but it is almost impossible to harvest the bulbs! We only have a few bulbs available each year. Plant the bulbs in late autumn at least 6" deep in well drained soil.